The TRX-100 is a CW QRP transceiver for the 40 meter amateur band. It was available from Mizuho in the early 1980s as either a kit or built and tested. Output is 2W key down. 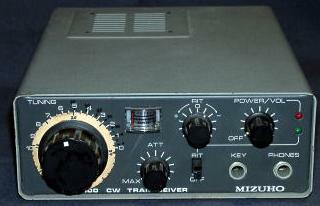 The RX-100 is a 40m amateur/SWL receiver which was offered as a kit only. The TRX-100 and RX-100 were only sold in Japan and are quite rare in the US and UK. More information and specifications to follow.